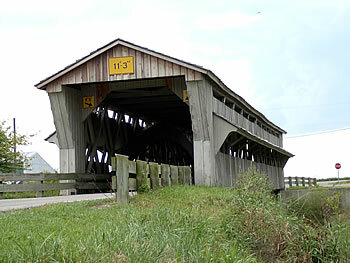 The history of covered bridges can be traced as far back as 780 B.C. in ancient Babylon. In America the first covered bridge was built in Connecticut in 1804 by Theodore Burr. Named the Waterford Bridge, it spanned the Hudson River in New York and lasted for 105 years. The next two were built years later in 1851 and 1852 in Oregon City, Oregon, but were washed away by floodwaters in 1853. Before there were covered bridges there were ferries to transport horses, passengers and buggies to the other side of the rivers. Many of these were run by merchants holding the monopoly on the local economy with the fees from the ferries. This prompted taxpayers to build bridges that would be free to all travelers after a toll to help offset costs. 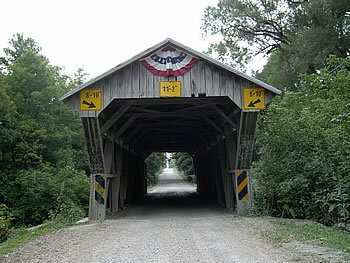 The Chambers Road Covered Bridge is located in Delaware County, Ohio on Chambers Road (TR63). Built in 1883, the 73 foot long bridge crosses Big Walnut Creek. Early bridges were built for utility. The later ones were also built with appearance in mind. Although Connecticut boasts the first covered bridge in America, Pennsylvania is usually foremost in the minds of covered bridge lovers. At least 1,500 were built from 1820 to1900 and Pennsylvania has the largest number of covered bridges in the nation: 219 in 40 of its 67 counties. The longest covered bridge in history was built in 1814 in Lancaster County, Pa., at a distance of 5,960 feet more than a mile. Unfortunately, it was destroyed in 1832 by ice and high water. Most of America's covered bridges were built between 1825 and 1875. By the 1870s, most bridges were covered at the time of construction. The original reason for the cover was to protect the bridge's trusses and decks from snow and rain, preventing decay and rot. The cover served other purposes also-it kept horses from being spooked by the waters underneath, it was a reprieve from weather to the weary traveler, and it was used for political rallies, religious meetings, a night's sleep for tramps, town meetings, poker parties, sweethearts' rendezvous, drunken revels, dances, and even rainy-day luncheons took place on the covered bridge. An uncovered bridge would last approximately 20 years but a covered one could last 100 years. Floods washing away the bridges caused the need for redesigning them. Builders began to use a combination of iron and wood trusses. The invention of the automobile encouraged builders to use steel. But with World War I came a shortage of steel and the wood bridges again became the norm. Now they were being built with windows, laminated floors, asphalt surfaces and interior whitewashing. The McColly Covered Bridge was built in 1876. Located near Lewistown, Ohio on CR 13, the 125 foot long bridge crosses the Great Miami River. More than 12,000 covered bridges have dotted the American landscape, with approximately 3,500 in Ohio. However, today in central Ohio covered bridges are very hard to find. Recently, I went on assignment to photograph covered bridges. Spanning five counties in two weekends, I was disappointed to see that many of the bridges had vanished. Some have been moved to private land or parks, some are gone and I could not locate two of them. Very few of the existing ones are used anymore. One bridge's interior was covered with spray painted graffiti. In the countryside of remote Delaware County, the bridge was located in a sparsely populated area making it vulnerable to night vandals. A trip to southern Fairfield County provided a glimpse of a 122-foot truss type covered bridges that had been build in 1883, and one hundred years later moved and partially rebuilt on private property. Several photographs proved useless due to the present day items blocking part of the bridge from the camera. Another bridge could not be located at all. Another was found at the Lancaster, Ohio, fairgrounds and another on the local college campus. Other bridges of scenic Fairfield County were found on private property or in public parks, however, a few are still used. In Franklin County I found three bridges, one on private property and two on public property. I then went northwest into Union County where I found a beautiful 102-foot truss bridge built in 1873. Free of graffiti and spanning the Little Darby Creek, the bridge proved photogenic above the rushing waters of the creek. Further west I went into Logan County where I found the McColly Covered Bridge in Amish country. Another truss type bridge, the McColly, built in 1876, spans 125 feet over the Great Miami River. Located in a very remote part of the county, the bridge is in mint condition. Ohio is second to Pennsylvania in remaining covered bridges. All over America concrete and steel have replaced instead of repaired the structures that are so vital to our historical past. Down from 3,500 to approximately 138, the historic covered bridge that Ohioans over the centuries have enjoyed is quickly disappearing. 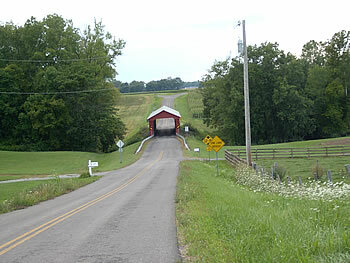 The Bigelow/Little Covered Bridge is located on Axe Handle Road in Union County, Ohio. With a length of 102 feet, the bridge crosses over the Little Darby Creek and was built in 1873.